AMERICAN VAMPIRE flashes back to two very distinct points in American history. The first tale comes from the early 1800's with the "The Beast in the Cave" featuring art by the legendary Jordi Bernet (Torpedo, JONAH HEX). Learn about the original American Vampire, Skinner Sweet, and his involvement in the brutal Indian Wars, and an ancient evil hidden in the heart of the Old West. Plus, more about the man Skinner used to call his best friend - James Book!The second tale comes straight from 1950s America, where AMERICAN VAMPIRE is terrorizing the suburbs with hot rods, teenyboppers and fangs! "Death Race" focuses on ferocious new vampire hunter Travis Kidd - but what is his connection to Skinner Sweet? As the story comes to a violent end, a sworn enemy's identity is finally revealed, and lots of blood is spilled! Considering how much I enjoyed Volume 3 (reviewed here!) 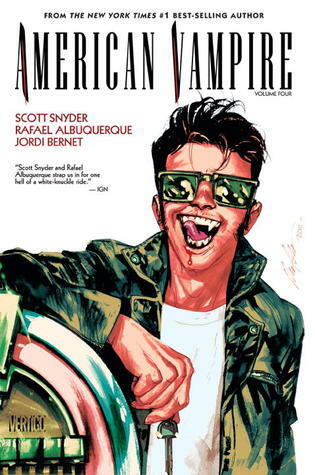 of American Vampire I was bound to pick up the next instalment as soon as I could afford to - I love graphic novels and I'm happy to pay a little more for them than I would for any other book, but when you need to catch up on a series and buy three at once it gets pretty pricy pretty fast! A part of me was hesitant to pick up Volume 4 because I loved Volume 3 so much, I was worried I'd somehow find this volume hugely disappointing because it wasn't the previous one, but I ended up enjoying it quite a lot. After the sheer awesome that was the previous volume, I think Snyder's decision to take a break from those characters was wise; instead our first story in this volume shows us James Book and Skinner Sweet in their youth - it was nice to see a pre-vampire Skinner and a not-dead Book! - the second took us to the '50s and introduced another new character: Travis Kidd, and the third showed us something of Calvin Poole and the racial tensions in mid-20th century America, with just a brief glimpse of Pearl and Henry. My favourite story in this volume would have to be Travis Kidd's, which surprised me. I was a little wary going in that Travis was going to be a very typical character; a Skinner Sweet in miniature, only with less fangs. Instead he was an interesting character with an interesting set of wooden teeth, and I loved the James Dean, rebel without a cause vibe to his story which really suited the era it was set in. I look forward to seeing what he gets up to next. I'm still not entirely sure how I feel about the first story which explored the history between Book and Skinner. I feel like too many enemy stories start out with two guys who were 'once like brothers', so I was a little disappointed Snyder decided to go down that route for these two, but having said that the two of them once being like family does make their inevitable war against one another all the more bittersweet. I would like to see more of Mimiteh in future, a Native American vampire who seems like a cool, but lethal, lady. I'd love to know if she and Skinner have ever crossed paths. I liked the way Calvin's story played around with prejudice, and also introduced us to what seems to be a new species of vampire. Snyder just keeps on expanding this world he's created, and I love how his imagination works. My main criticism of this volume, and the reason I didn't rate it as highly as the previous, was simply because there weren't enough ladies in it for me. I wasn't too keen on the fate of Piper, Travis's 'girlfriend', and there were times when I felt Mimiteh was rather sexualised, but that could just be me being very picky. Pearl and Felicia usually have quite a bit of 'screen time', so I suppose it's only fair the boys get some, too! I'm still loving this series, and I'm looking forward to seeing what happens in the next volume! Top Ten Tuesday | Summer TBR! Should Our Books Have Trigger Warnings? How Do You See Cinder? Top Ten Tuesday | Lights, Camera, ACTION!